Söndörgő are a Hungarian group, comprising three brothers, their cousin and a school friend who play folk tunes from Hungary and other countries on various sized tambura – a mandolin-like instrument – and also on the flute, clarinet, drum, double-base and various other exotic instruments as well as vocals now and then too. Sometimes quiet and melodic at other times fast and furious, they are versatile and well worth catching if they tour the UK again! Have a taster! CDs were on sale on the night. The National Centre for Early Music (NCEM) is a brilliantly accessible venue with a ramp and then heaps of space inside. OK, the thresholds meant a bit of a bump but nothing drastic and it was easy to find a place to sit then put my Luggie scooter to one side or if you were in a wheelchair you could easily site it at the end of a row or move a chair out of the way. As we entered the auditorium, staff offered to help should we need it. In fact, the evening we were there for Söndörgő, there were three people using wheels of various kinds. There is an accessible loo and leaflets are displayed at a reachable height. They also do refreshments: beer, wine, soft drinks etc before the show and during the interval. We have been to the NCEM many times and have never had a duff experience although we always choose bands with at least four musicians as there was one occasion when there were only three and though lovely, the music did sound a little thin. We have seen some groups which you could describe as ‘early’ music (medieval Spanish) but mostly we’ve see what I guess you would call world music: Indian, Jewish, Eastern European – they have a huge variety! It’s a wonderful venue, being a converted church and with the friendly staff and great music there is always a lovely atmosphere. If ever you are going somewhere with someone with mobility, hearing, visual or other impairment, it’s worth having a look at the DisabledGo website first. It has access information about a good range of places in the UK. You can search for accessible places such as restaurants, hotels, shops and parks in a particular place and they are listed along with symbols to say if they have ramp access, accessible toilets, large print menu, if the staff have disability awareness training. This part is compiled by surveyors from the website. For most places but not all you can click for a more detailed description of the access. The different categories of information, for example, parking, outside access, toilets, will expand to give further detail such as distances, whether doors are automatic, light levels etc. and sometimes there are photos which is a really good idea. However I find I am still not entirely sure whether a venue is accessible or not. The description might say ‘There is not level access’ then in another section it talks of ramps without making it clear exactly where it is you can find the level entrance if there is one. I wonder if the issue arises from venues filling out a form rather than describing the access themselves. At least the form-filling means they mention plenty of issues such as colour contrast or whether there is piped music but in the end, I would not feel confident visiting some of these venues without checking with them first about access. I investigated a particular York restaurant that is accessible but according to DisabledGo it has an accessible toilet that does not have level access to it! I checked with the venue and indeed, they do have level access to the accessible toilet and I suggested they might like to get the error corrected but it is still there – either unreported or uncorrected! Another restaurant, which I know has a step to get in, has the symbol for ramped access – does this mean they will provide a ramp? It is not explained. An entry for a York park says it does not have level access to get in but if you click the additional information it explains that the ramp bypasses the steps – you could easily miss that information (plus I know there are several other entrances which are level anyway) and it says there is not level access once you are in but again I know it does as I go there often with my scooter! Elsewhere, a country park mentions that some paths have steps but does not actually say they provide you with a map so that you can avoid them. Am I nit-picking? Anyway, potentially a really useful site and definitely worth consulting but it is still worth checking with the venue if you need to confirm some of the details. 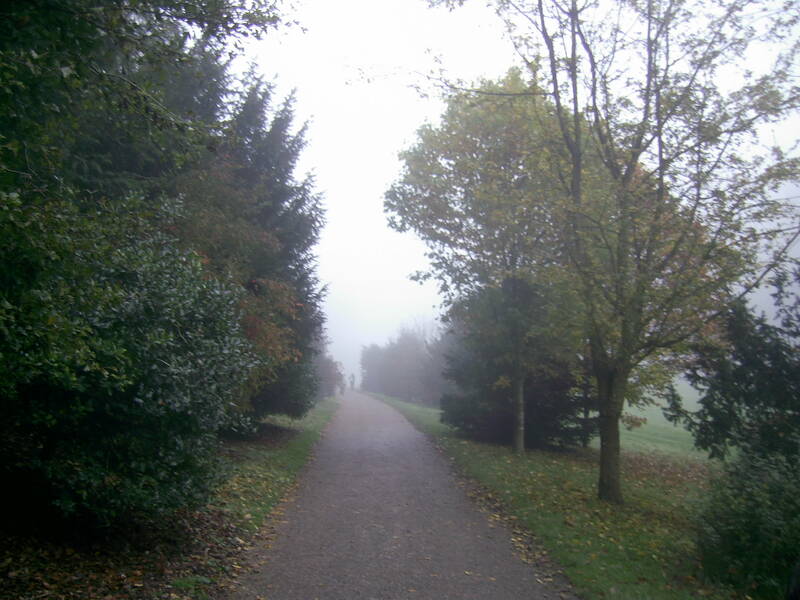 A foggy day at Fountains Abbey! 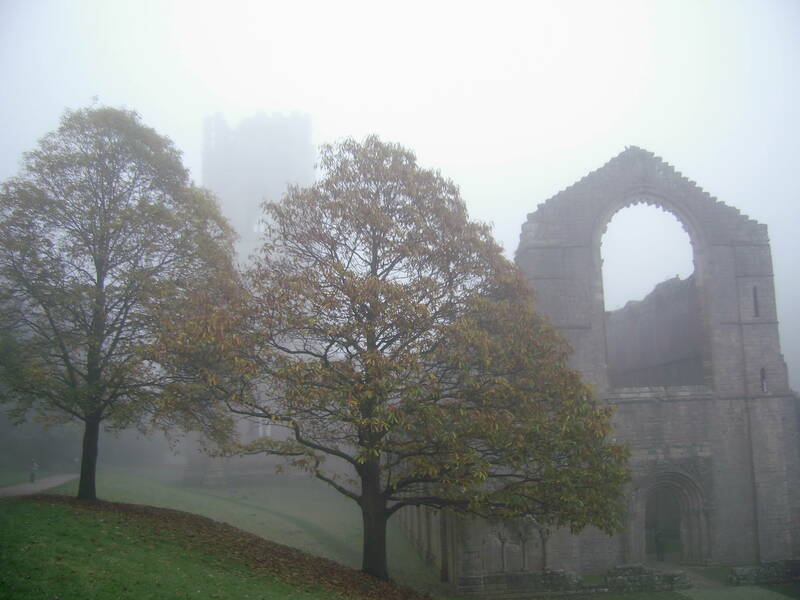 Fountains Abbey in the fog! OK, so sunshine would have been great but it was so atmospheric with the abbey ruins looming out of the murk! Park at the West Gate entrance and this is where you may need someone to help, go to the lodge at the gates and they will show you what to do: they open the gates so you can drive in and park and they bring the scooter to you. (Presumably you could also leave your car in the car park which has blue Badge spaces). The paths are lovely and smooth and the setting is magnificent. We would have explored further if the weather had been better as the grounds are extensive. Following the main path, you eventually come to the lake at the Studley Royal end – I was looking forward to going along by the lake but at the lodge house here they said you can’t take the scooters along there as they aren’t insured. You can go through the gates and visit the tea-rooms just outside them which also have outside seating. There are various accessible loos in the grounds but I’m not sure if any are big enough to take the scooter so that could be slightly problematic. They are really fabulous scooters – substantial without being too huge and really easy to use (this is compared to the ones at Roundhay Park). To book or enquire ring: 01765 608888. I definitely fancy going back in warmer weather! 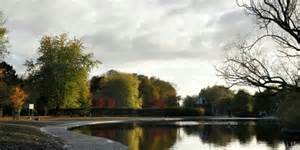 Rowntree Park is always lovely but particularly so in Autumn and just fabulous right now! In Spring it has daffodils and ducklings; there is a ‘reading-café’ which is accessible, a children’s play area and tennis club and you can access the river walkways with their viewing points and the Millennium footbridge over the River Ouse. Parking is reached via Terry Avenue. 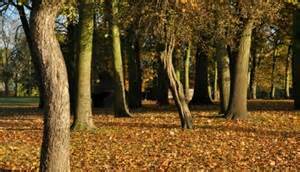 The paths are smooth so the whole place is eminently scootable as are the paths by the river. Look out for the flood levels on the dove cote (itself a memorial to Rowntree’s workers who died in WW1) – the one from 2000 is way above your head! The drawback is that the park does flood so is sometimes closed while levels recede and the place dries out a bit. Also the large amount of geese (or rather their droppings) do mean you can’t just sit anywhere on the grass but there are plenty of benches.